Palestinian postal service employees are working overtime to sort through some 10 tons of letters and packages blocked by Israel for up to eight years, Palestinian officials said Tuesday. 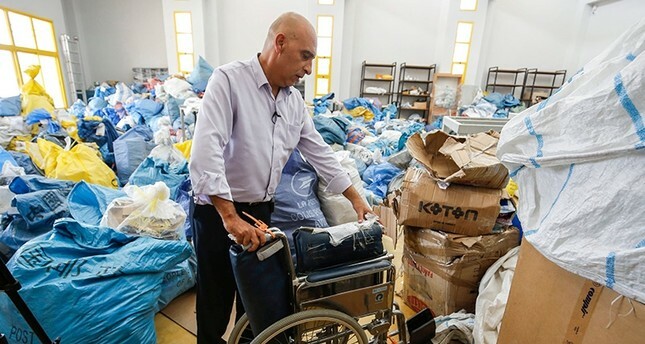 The goods range from simple letters to medicine and even wheelchairs for the disabled, AFP journalists found at the sorting center in the occupied West Bank city of Jericho. Ramadan Ghazawi, an official at the sorting center in Jericho, said he understood some items had been blocked for security reasons, while others were barred on administrative grounds. "A few days ago Israel allowed more than 10 tons of postal parcels that were stuck in Jordan," he told AFP. Israel controls all entrances and exits to the occupied West Bank and can prevent goods passing through as it sees fit. The policies have crippled Palestine's economy and its residents' freedom of movement. In the sorting center, hundreds of bags were piled on top of each other as workers picked through them in the stifling summer heat. COGAT, the Israeli defense ministry body responsible for civilian coordination in the Palestinian territories, said the release was part of confidence-building measures after the two sides agreed on a postal entry deal "about a year ago." It said while the deal had not yet gone into force for future deliveries, it had "allowed a one-time transfer of approximately ten and a half tons of mail that had been held in Jordan." Some of the transferred goods had been broken, and Ghazawi said that to avoid complaints they were delivering them along with a statement saying Israeli authorities had delivered them in this condition.